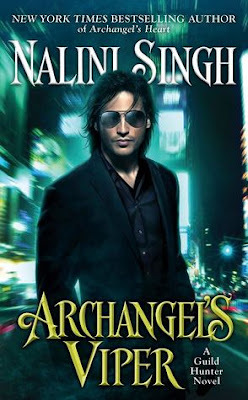 Archangel's Viper by Nalini Singh is the tenth book in Guild Hunter series but the first that I have read. That being said, I absolutely adored this book. Not being a fan of angels and archangel stories, I was skeptical in diving in this book but once I started, I just couldn't stop! The cover is average but the blurb is intriguing and traditional Nalini Singh writing. It has all the ingredients of a memorable story. A strong plot, fluid and engaging narrative, the right mix of emotional play and scorching chemistry, headstrong characters and a mystery that keeps the reader on edge throughout the book. While it is part of a series, Archangel's Viper can be read as a standalone but it is always recommended to read books from a series in order. 4.5 super shiny stars to Archangel's Viper and Njkinny recommends this book to all paranormal romance lovers above the age of eighteen. I look forward to reading the other books in this series and eagerly await the upcoming one. I received an ARC from the author and the publisher via Netgalley and I am very thankful to them. The above is my honest and unbiased review.